January 21, 2019 By Will Dabbs, M.D. & filed under All Articles, Rifles & Carbines, Weapons. M1 Carbine armed paratroopers, Infantrymen, cooks, tankers, signals troops, and many others in all theaters of combat during WWII. As early as 1938, American military planners were seeking a light rifle with which to arm mortar crews, signals personnel, truck drivers, and command and staff officers. They initiated this quest based upon empirical observation and analysis. During peacetime exercises, it was found that the M1 rifle (we call it the Garand, but troops of the era called it the M1) was too big, heavy, and cumbersome to facilitate the tasks required of support troops. In actual practice, a slung M1 would frequently catch on brush or force the helmet down over the eyes. When slung diagonally across the back for easier portage, the M1 prevented proper wearing and management of field packs and haversacks. As a result, the military issued a request to industry to develop something handier. This new weapon was supposed to weigh less than five pounds and still remain lethal out to 300 yards. It was to be markedly more compact than the standard M1 rifle yet remain appreciably more effective than a handgun. Though the request was fielded in 1938, the formal requirement was not codified until 1940. The subsequent competition began in 1941. In one of those quirky twists of history, the winning prototype was bodged together in just 13 days. 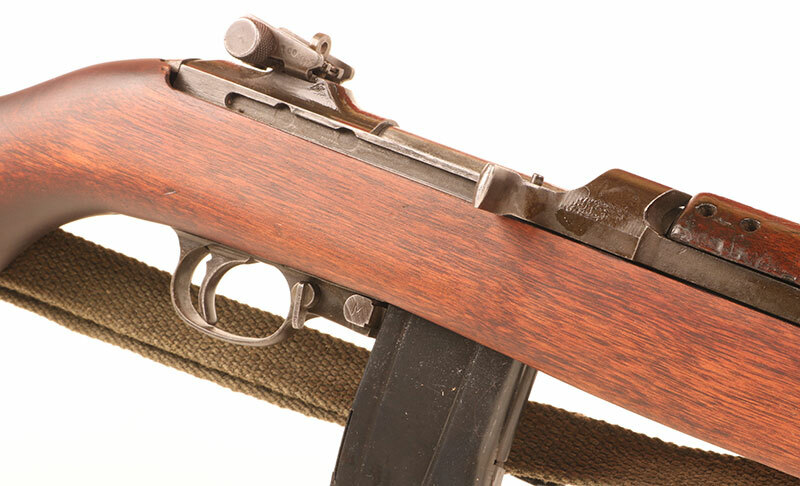 Early M1 Carbine sported simple flip adjustable rear sight and lacked a bayonet lug. Standard magazine pouch packed two 15-round magazines and could be carried either on the belt or the stock. Winchester was fully involved with the development of the .30-06 M2 intended to upgrade and ultimately replace the M1 Garand, so their involvement with the carbine project was little more than an afterthought. John Moses Browning’s brother Jonathan “Ed” Browning originated the design. David Marsh Williams, a convicted murderer who crafted weapons in a prison workshop, contrived the gun’s short-stroke piston system. A team of Winchester engineers scaled down the .30-06 M2 rifle design and incorporated input from Browning and Williams to ultimately birth that first Carbine prototype. This lithe little thrown-together rifle subsequently eclipsed everyone else’s efforts. The Carbine was standardized in October 1941. Six weeks later, the world veritably exploded. Audie Murphy was the most highly decorated American soldier who ever lived, and he swore by the M1 Carbine. The young American officer gripped his Carbine in his left hand and an armed grenade in his right. Creeping up behind a rocky outcrop, he was suddenly spotted by a Wehrmacht sentry with an MP40 submachine gun. As the German pivoted to bring his weapon to bear, his muzzle caught on intervening brush, and his burst went wide. The American officer lobbed his grenade and simultaneously stroked the trigger on his Carbine left-handed. Before the grenade detonated, the U.S. soldier had gut shot a pair of Germans with .30-caliber Carbine rounds, taking them both out of the fight. The American tossed two more grenades in rapid succession, killing four of the eight Germans occupying the fighting position. Three more were combat ineffective due to wounds. The eighth, a particularly heavy man, then tried to run. The American officer leveled his Carbine, drew a bead on the back of the man’s helmet, and squeezed off a single round. The coalscuttle helmet jumped, and the fat German soldier dropped dead. 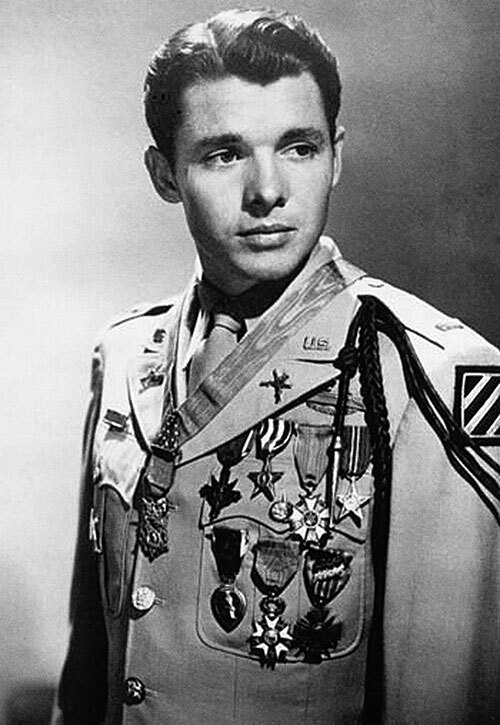 The American officer was Audie Murphy, the most highly decorated American serviceman who ever lived. His autobiography To Hell and Back is a superb read. 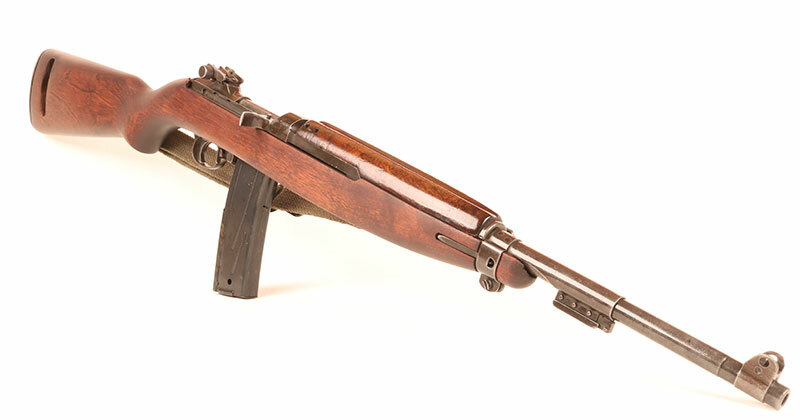 M1 Carbine in its final configuration was a mature and effective weapon. Reliable, lightweight, and maneuverable, it was everything its designers had intended it to be. 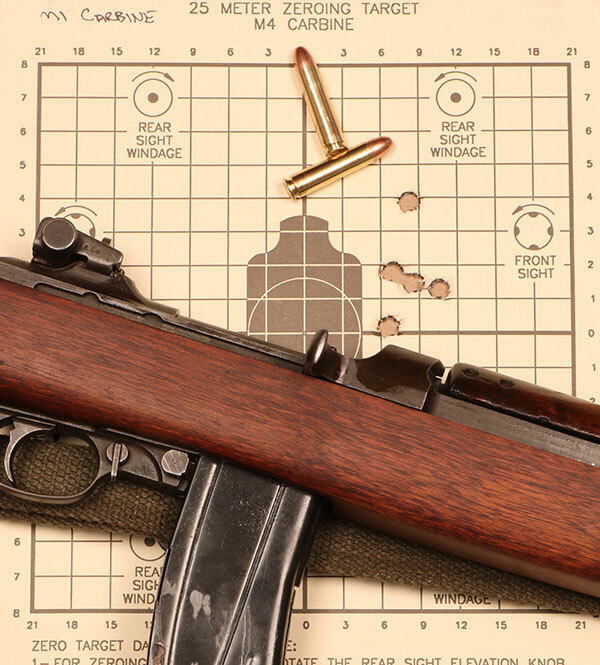 The M1 Carbine pushed a 110-grain FMJ bullet to just shy of 2,000 feet per second. The Carbine round carries about as much energy at 100 meters as a 9mm Parabellum does at the muzzle. The Carbine soldiered on through three wars and remains in production today. That’s not bad for a gun that was thrown together in less than two weeks! XM177 is shortened version of standard M16A1. This stubby little assault rifle armed pilots, dog handlers, and Special Forces operators who needed compact personal weapon that could still deliver prodigious volume of fire. 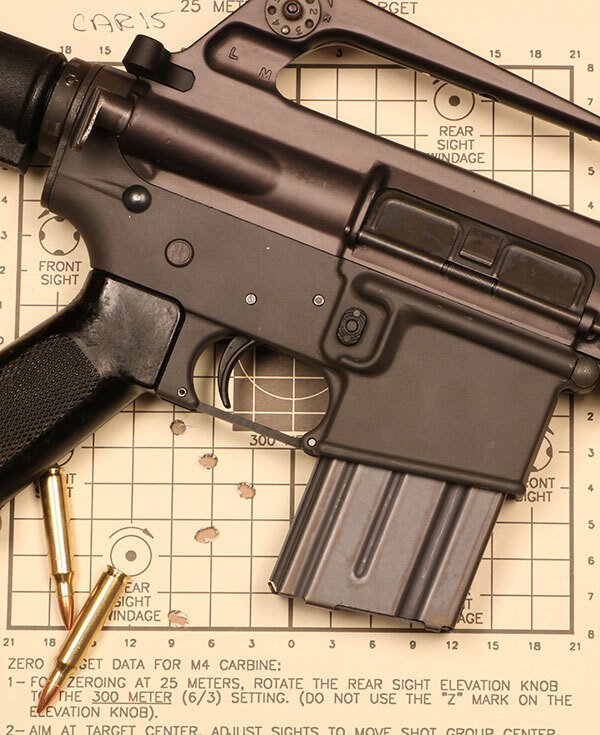 The origin story of the M16 is foundational dogma among gun nerds like us. Initially birthed in 1956 by Gene Stoner, James Sullivan, and a few others while working at a tiny little California startup called ArmaLite, the family of weapons that became the M16 had a colorful lineage. The earliest AR-10 saw action with Portuguese Special Forces in Africa, while the U.S. Army ultimately came into the M16 by way of the Air Force. Despite some ignominious combat performance early on, the M16 ultimately matured into an effective and reliable combat rifle. AR stands for “ArmaLite Rifle.” Once ownership of the weapon passed to Colt, they set out to change that perception. The marketing solution was the CAR-15. The CAR part stood for “Colt Automatic Rifle,” and this was the informal name applied to shortened carbine versions of the M16 developed in the mid to late 1960s. 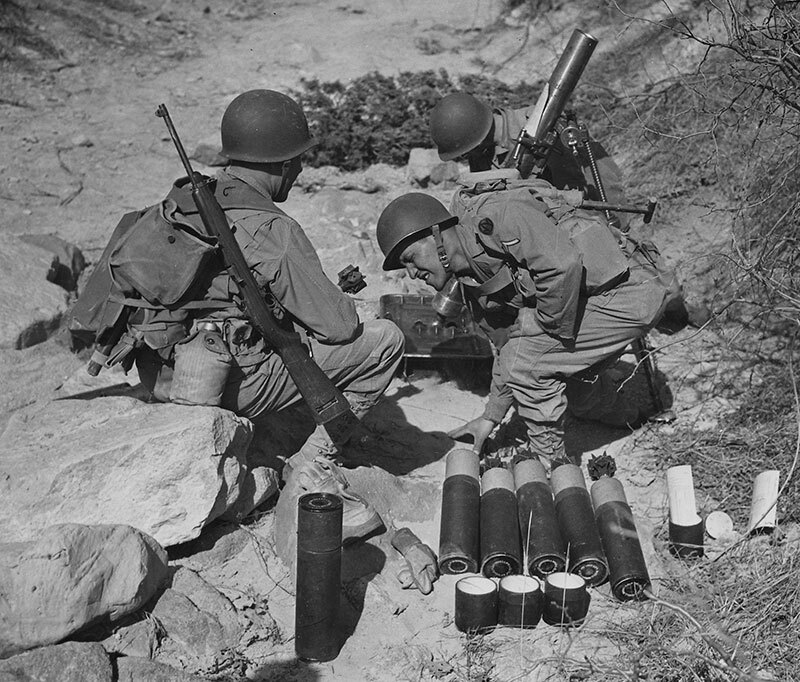 M1 Carbine was designed to arm support troops like these mortar men, for whom direct contact with the enemy was a secondary concern. The U.S. Army in 1965 drew the same conclusion their fathers had drawn in 1938: platoon leaders, pilots, and Special Forces personnel needed something shorter and stubbier than the standard-issue M16 rifles of the day. 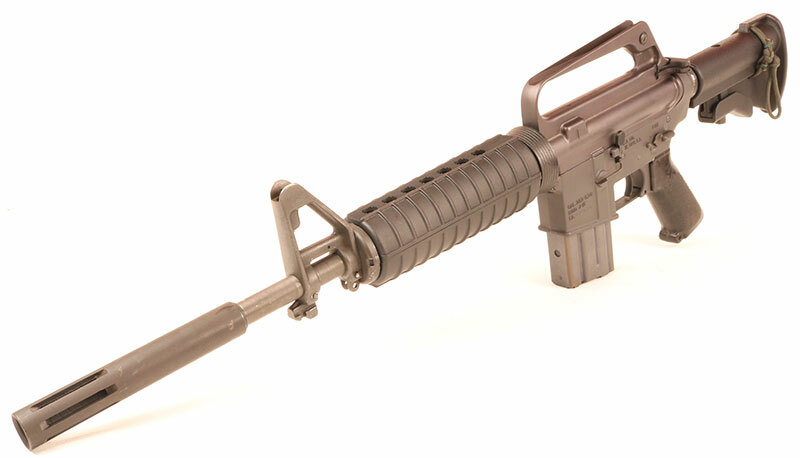 The end result was a standard M16 action mated to an aluminum collapsible stock and radically shortened barrel. Referred to alternately as the Colt Model 610, the XM177, or in Air Force parlance, the GAU-5/A, the resulting compact M16 variant saw extensive service in Vietnam. The curious thing about the XM177 was the deleterious effect it had on the tiny little 5.56mm cartridge. The primary selling point for the 5.56mm round was that it made up for its diminutive mass with some simply blistering velocity. Where the M14 pushed a 147-grain bullet to about 2,800 feet-per-second (fps), those early 55-grain M193 5.56mm rounds hit 3,150 fps out of the 20-inch barrel of an M16 rifle. The XM177 came in two minor variations. One had a ten-inch barrel and the other had an 11.5-inch tube. The muzzle attachment that these guns used has been classified as a sound moderator subject to NFA restrictions by the BATF. While these guns were indeed lightweight and portable, cutting the barrels in half dropped the muzzle velocity to about 2,500 fps. Advent of vertical envelopment via rotary-wing aircraft in Vietnam involved a lot of aircrews operating at low level over hostile territory. These aviators required personal-defense weapon that was easily stowed yet could still deliver proper volume of fire. 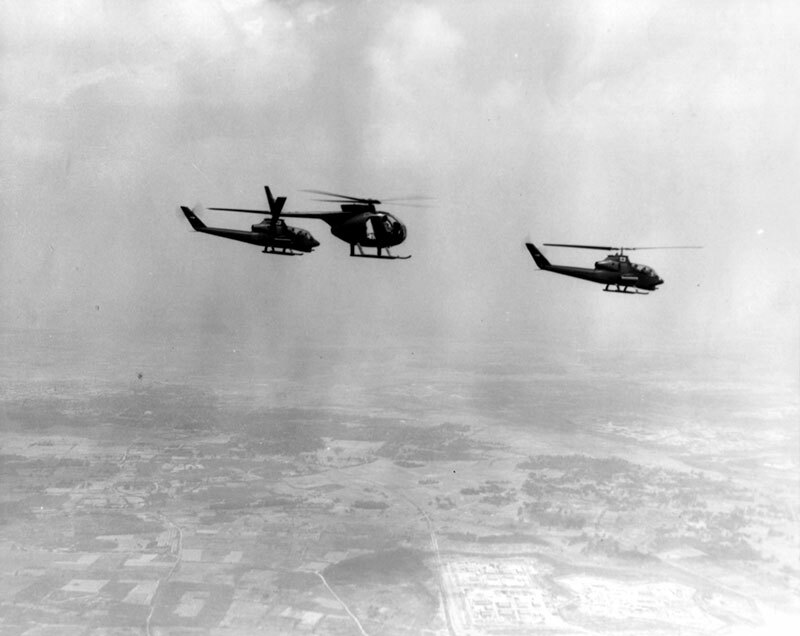 It was a typical Aeroscout low-level reconnaissance mission in an OH6A Loach armed observation helicopter. While zipping through the treetops in pursuit of a Viet Cong ambush party, the pilot committed the cardinal sin and got in a hurry, unexpectedly overflying a heavy machinegun position. From a range of about 15 feet, the VC gunner riddled the tail boom and one rotor blade. The aircraft picked up a heavy vibration, and the engine died. The pilot did an immediate and violent autorotation into the jungle. Late-model M1 Carbines featured rotating safety lever and adjustable rear sight. The crew chief climbed out of the wreckage, kicked in the bubble, and pulled the pilot free. Both aviators were injured but could move. On the way out, the pilot grabbed his CAR-15 and a bandoleer of ammunition. Between the two of them, they had two 1911 .45 automatics, a snub-nose .38, the CAR-15, an M60, and two fragmentation grenades. The VC finally spotted their trail, and began to fire sporadically into the area. During a pause in the enemy fire, the pilot leapt up and loosed a long burst from his CAR-15. The enemy patrol was by now about 75 feet away. Two of the VC fell mortally wounded, and the rest retreated into the jungle. The Aeroscout pilot was a young American officer named Hugh Mills. His classic tale of combat in light observation helicopters in Vietnam is legend among American Army aviators both past and present. His book is titled Low Level Hell and is available on Amazon. Although this particular Carbine is more than 70 years old, it still rendered decent combat accuracy at 25 meters, a typical engagement range for such a defensive rifle. The XM177 weighs about a pound more than does the M1 Carbine. WWII-era M1 Carbines fed from 15-round magazines, though 30-round versions saw widespread use in Korea and beyond. I have read that only around 1,000 30-round M16 magazines made it into theater in Vietnam before U.S. forces pulled out. This means that stubby 20-round boxes would have fed almost all the XM177 rifles used during the war. Every Vietnam-era combat veteran with whom I have spoken told me they downloaded their magazines to 18 rounds for enhanced reliability. As a result, the XM177 would have, if anything, a diminished onboard magazine capacity compared to the M1 Carbines of the same era. The XM177 is the more comfortable weapon but not by much. The selector is more easily managed, and the elevated sights provide a less cluttered sight picture than do those of the M1 Carbine. The M1 sights are low and close to the bore axis, but their heavy fencing and the sunken nature of the forearm can serve as distractions, particularly when running the gun in a hurry. But the rigidly reciprocating charging handle on the M1 means you can take a boot to the action if need be. I have run lots of full-auto rounds through this barrel over the past quarter century, but it still shoots fairly straight. But older M1 Carbine shot a little straighter. Recoil is negligible on both guns, though the XM177 is hugely noisier. The in-line design of the XM177 is indeed more efficient than that of the M1, but again not by much. The pistol grip on the XM177 makes the gun easier to control, and the collapsible stock makes it more readily stowable. Double taps are comparably smooth with either platform, and they both move quickly indoors or in tight spaces. I have run a zillion rounds through both guns over the years. Whatever benefit might be offered by the advanced materials science of the XM177 is offset by the filthy nature of the direct gas impingement system. I would rate the two guns as comparably reliable if properly maintained. Accuracy is demonstrated in the table below. Given the XM177’s stubby barrel, the M1 Carbine actually carries more muzzle energy and shoots a little straighter to boot. Both my examples are fairly shopworn, but they should be comparably so. M1A1 paratrooper Carbine might win some cool points, but is not nearly as effective as standard version in practical use. We delivered 800,000 semiauto M1 and selective-fire M2 Carbines to the government of South Vietnam for use against the communist insurgency fomented by the North. An acquaintance who was a missionary in that unfortunate country during the height of the conflict kept both an M1 and an M2 in his home in case of emergency. He told me they were everywhere and easily acquired. The XM177 went on to evolve into the M4 Carbine that is carried by our boys and girls downrange as I type these words. 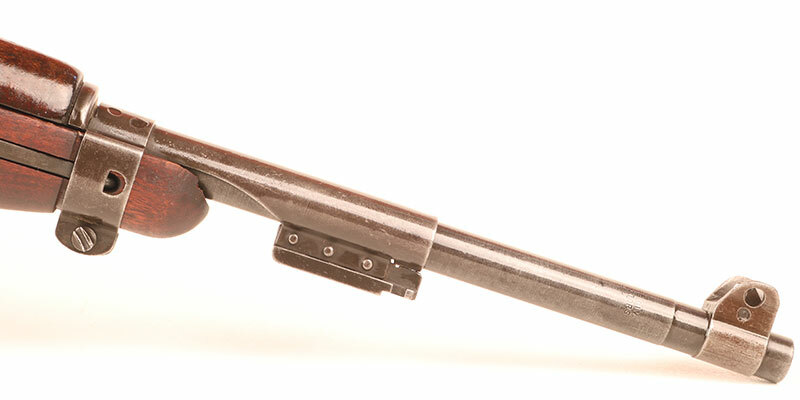 The barrel ultimately stretched from 10 to 14.5 inches, and the bullet weight grew from 55 to 62 grains, but the basic concept has remained the same. Chop back the barrel and velocity drops. Chop it back too far, and you have just made a very loud, very expensive .22 rifle. At the end of the day, the later XM177 Carbine was not really much more capable than its forebear. 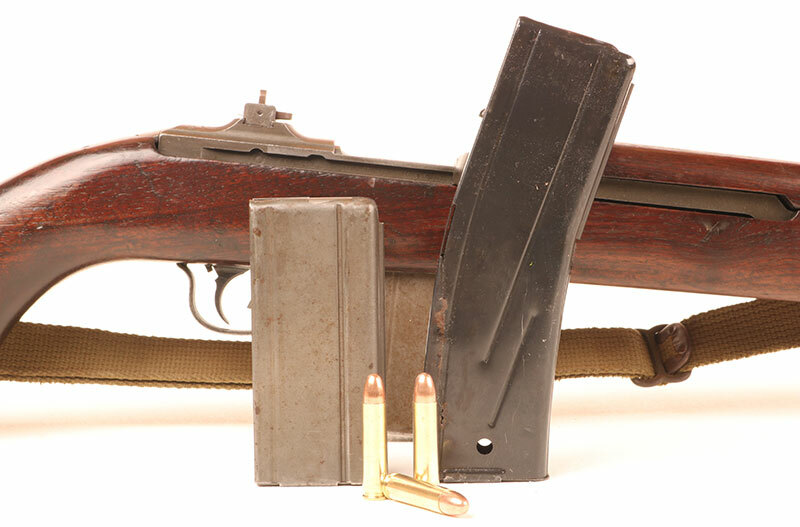 M1 Carbine fed from either 15- or 30-round box magazines. Thirty-round mags showed up at very end of WWII. Neither gun was quite so wretched as some uninitiated observers have claimed. Both weapons represented a quantum improvement over the combat handgun, which was the point of the exercise in the first place. But in the final analysis, it is indeed thought provoking to ponder both rifles and appreciate that 25 years of evolution did not make quite as much difference as perhaps we once thought. 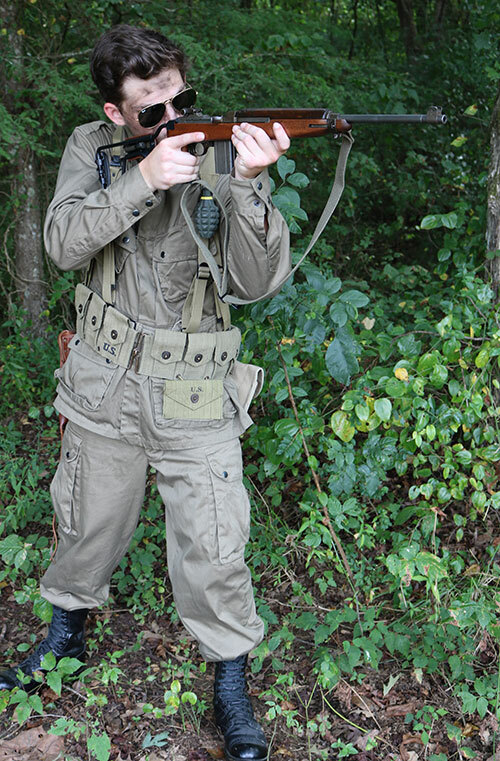 Special thanks to www.worldwarsupply.com for the gear we used in outfitting our World War II-era American paratrooper. 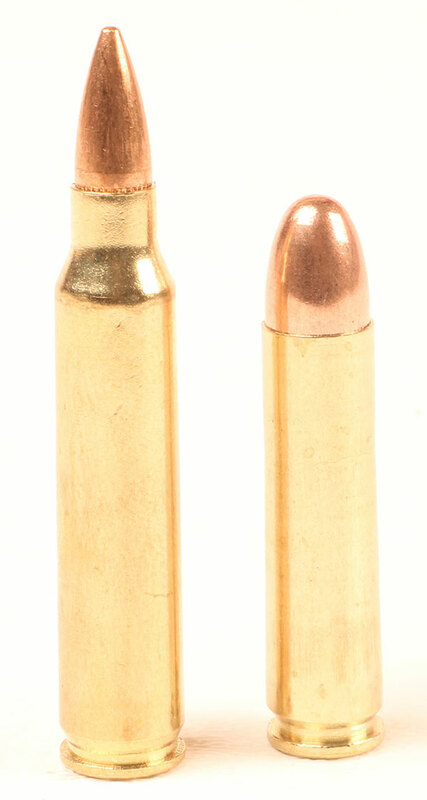 5.56x45mm round (left) is a good bit bulkier than M1 Carbine’s 7.62x33mm cartridge. Bayonet lug on M1 Carbine was later addition seldom found on WWII-era guns. Early M1 Carbine sights were drift adjustable for windage only. Group size is best four of five rounds fired from a simple rest at 50 meters. Velocity is average of three rounds fired across a Caldwell Ballistic Chronograph oriented ten feet from the muzzle.